From highly economic narrowband timber product up to high-throughput commercial timber processing lines, Wood-Mizer’s Sawmilling Solutions team are available to design the ideal system to meet your requirements. Below are just some examples of the complex and customizable lines that can be designed completely to meet your needs. Wood-Mizer’s global engineering team and systems specialists look forward to hearing your challenges and planning new solutions that will achieve your goals. For a highly affordable, but end-to-end processing solution, the LT70 Remote System delivers narrowband recovery from raw logs, and offers low operating costs, and low labour requirements. 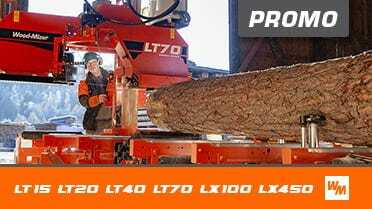 A log processing line that maximises log yield and minimises investment and operational costs. The SLP (Smart Log Processing) line uses thin-kerf blades on each sawmill unit in the line to deliver better log yield than other processing methods. Highly popular among pallet manufacturers, the SLP specializes in making the most profit possible from low value logs up to 400mm in diameter and increasing your competitive edge. Because the line is modular, machines in the line can be arranged to suit cutting needs as the market changes. Typical components include a Twin Vertical Saw, a Single Vertical Saw, a Multihead Resaw and a Multirip or Edger. Offering more automation and features to reduce production costs, the SLP2 is the next stage in increasing profits from small- to medium-sized logs up to 400mm in diameter. The line can be configured in different ways depending on product requirements and budget. As few as two or three workers can successfully manage the whole line due to its level of automation. A centralized control console positioned at the front of the line gives the main operator a full view of the work and puts all machine controls within easy reach. TITAN products are heavy-duty, and built-tough wideband sawmilling solutions for high-throughput industrial sawmilling applications. Each TITAN product is designed to operate as standalone unit that can be used in existing sawmilling lines or form an entire sawmilling line that can be customized to the requirements of the end-user.